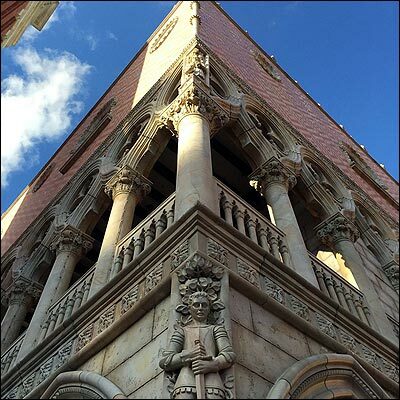 Marvel at the architecture, as you take in Disney's replica of the Doge's Palace at St. Mark Square in Venice. Complete with an 83 foot belltower, this replica of the campanille is so authentic that it even features a gold leaf topped Angel, just like the original. The Fontana de Nettuno, inspired by Bernini's Neptune Fountain, graces the Plaza del Teatro, where live musical performances take place daily. Along the edge of the World Showcase Lagoon, gondolas are tied to striped poles, reminiscent of those found in the canals of Venice. Sample the sights and sounds of Italy and be sure to bring your appetite! 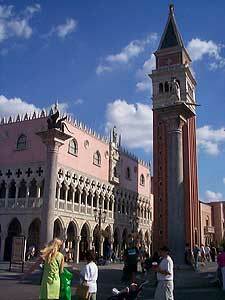 The Italy Pavilion is home to three delectable eateries, featuring authentic Italian fare in a picturesque setting. From the more formal Tutto Italia to the lively and immensely popular Via Napoli (home of the best pizza in Florida), to the wine cellar, Tutto Gusto, your tastebuds will sing "That's Amore!" When you've been sufficiently stuffed, browse the shops featuring authentic Italian clothing, jewelry, handbags, and perfume. Click below for menus! Watch the flags fly as the choreographed flag-throwing team of Sbandieratori Di Sansepolcro delights and amuses guests during their daily street performances.